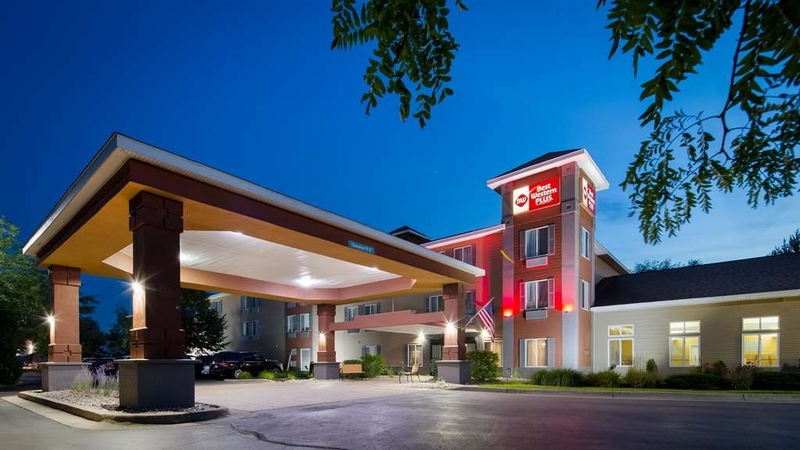 El Best Western Plus Coldwater Hotel se encuentra en el centro de Coldwater. Venga y disfrute de las mejores atracciónes turísticas cerca de nuestro hotel. Precios bajos garantizados y ofertas exclusivas. 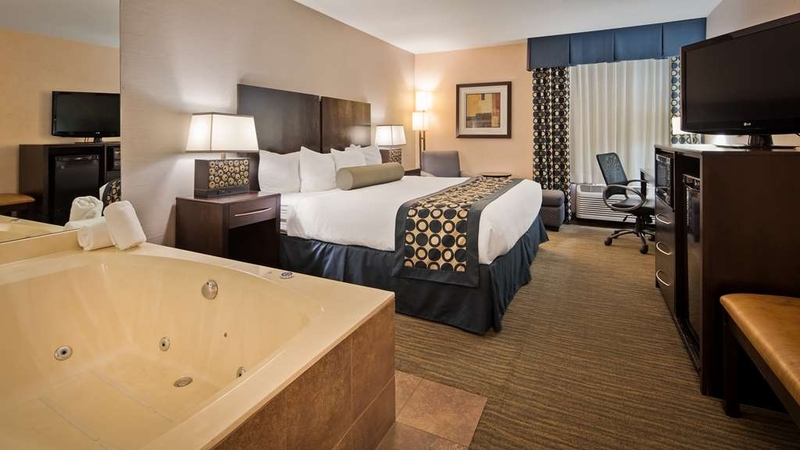 Bienvenido al nuevo Best Western Plus® de Coldwater. Nuestros huéspedes podrán disfrutar de un excepcional servicio de atención al cliente y de unas instalaciones aptas para mascotas. Este hotel está situado a poca distancia del circuito Michigan International Speedway, los centros comerciales de tiendas directas de fábrica y numerosas empresas. Tanto si se encuentra en viaje de placer como de negocios, nuestro hotel le ofrece la habitación que necesita. Nuestro hotel de Coldwater ha sido totalmente renovado en 2012 y ofrece un moderno entorno con unas amplias y apacibles habitaciones y acceso gratuito a Internet Wi-Fi. Nuestra amplia piscina cubierta climatizada y la bañera de hidromasaje son el lugar perfecto para relajarse tras un día de recorridos por la zona. Con una excelente ubicación junto a la carretera I-69 y la salida 13 de la carretera US-12, nuestro hotel entiende que la comodidad y el confort van de la mano. Es por ello que también ofrecemos un suculento desayuno caliente gratuito todos los días. Este desayuno está formado por tortitas, fruta fresca, panecillos con salsa de carne, surtido de cereales calientes y fríos y yogur para que pueda comenzar su día de la mejor forma. El famoso café 100% Arabica BEST WESTERN y los jugos fríos son el complemento perfecto para esta gran variedad de especialidades. En este hotel de Coldwater somos conscientes de que al comenzar su mañana de la mejor forma podrá disfrutar de un magnífico día y de unas fantásticas vacaciones. Nuestro hotel de Coldwater estará encantado asimismo de recibir a huéspedes en viaje de negocios. Entre nuestros viajeros habituales se incluyen trabajadores de Paragon Metals, Michigan Gas Utilities®, ConAgra Foods®, EXO-S y Aleris. Tanto si se encuentra en la ciudad en viaje de placer como de negocios, puede contar con nosotros para convertir su estancia en una agradable experiencia. El cordial servicio, el mayor nivel de calidad y el valor de marca nos hacen destacar entre el resto de establecimientos. Reserve una de las apacibles habitaciones del Best Western Plus® Coldwater Hotel y disfrute de un cordial servicio durante su viaje. Disfrute de su estancia en nuestro hotel. "Night stay for in-town event"
This is the second time I have stayed at this facility within the year. My first visit was because they would accommodate my pet. Due to the allowance of my pet (during my first visit), and the friendly atmosphere, with nice morning breakfast resulted in my return stay (without my pet). The next time I am in town I will patron this establishment again. The hotel has a very friendly and efficient staff. They were consistently that way and it was appreciated. The hotel is well kept and very clean. We were very satisfied with the experience and will come back, if in area, or at least to another BW Plus. The only issues that we noticed were the following: road sign was very small so difficult to see, turning left out of hotel is very difficult, road going in to hotel had a lot of potholes, wifi was very weak, and someone had unplugged lamp in room, so when I pulled out night stand to plug back in, there were candy wrappers and dust behind the nightstand. Definitely a great stay, far superior to the Quality Inn in there. Great stay and value. The entire atmosphere and service exceeded out expectations. Stayed on the third floor which was very quiet. Highly recommend staying there when in Coldwater. My husband and I made a reservation through the Best Western 800 number. I told the gentlemen I was traveling with my chihuahua. When we arrived at the hotel at 9:30 p.m. to check in I told the desk clerk that I did have my chihuahua since she did not mention. She looked at me in a stunned manner and said I could not stay. They had no pet rooms available and it was not her mistake or problem since I did not call her direct. Which she repeated numerous times....it was not her mistake or fault....Offered to put me in a room for tonight on 2nd fl and move tomorrow to another room. That made no sense as you have to clean the room anyway just let me stay. No working to make things easy for the guest.Very ungrateful for customers. Could not care any less how they treat people. I called the Best Western 800 number back while there and they even talked to them and they would not budge on anything. The staff member at the 800 number was awesome and helped me get everything canceled and another reservation made. It is so easy to be kind to people and it takes a lot more effort to be rude and unwilling to help. Sure hoe they learned a lesson from this. I sure did....I will never attempt to stay at this hotel again and will tell everyone I know! We were very satisfied with the room for the value.Only exception to that is the location. It is difficult to see from the main road and a little hard to get to without going through other business lots. Dear Meander, Thank you for taking the time to complete the survey. I am glad that you had a great experience at the Best Western Plus Coldwater Hotel. We hope to see you again. Thank you. "Hard to find good cleaning help"
I have stayed at this hotel very often. I had set up a reservation and as usual upon arrival everything was great upon checkin I was given a room and went to it. I opened the door and was surprised to see the room was never cleaned and yet here I was. Of course I went back to the front desk and asked why I was given that room that wasn't clean. They were apologetic and didnt understand how it could happen bla bla bla. They then actually checked the next room for cleanliness and it was somewhat clean and the bed made but not sure if it was really cleaned or just gone over. The lady at the front desk asked if there was anything that could be done I asked for some bonus points but didnt get any of course . usually a great place to stay just thinking the lack of good help is catching up and more money needs to be paid for better help. "What's the saying you get what you pay for." "Had a few problems at first"
Initially checked in and noticed the sink wouldn't drain. Talked to front desk and were moved to another room. This room appeared to be ok, but upon further inspection, saw a discolored stain on the blanket, then, noticed a pair of socks that belonged to a previous customer. Pretty gross! The smoke detector in the hallway was also low on batteries and chirped all night long. Told the front desk about the issues the next morning, and the problems were corrected. This has always been a decent place to stay in the past, but it appears that the place may be starting to go downhill. Breakfast was standard stuff, but maybe eggs and sausage should have been cooked a little longer. Will give it another chance, but things need to improve. "One bad, many good things"
This is a very nice place, but the start of our night stay found a dried urine stain on the seat of the toilet when my wife first entered the room. That being found left us wondering all night what else might have been missed being cleaned in our room. I do like this place, breakfast girl was hardest working hotel employee I have ever seen (like almost catching the crumbs before they hit the floor good), and everything else seemed to be well taken care of. I still would recommend them and would stay here again, but for us on this stay it was not a five star stay. Very clean, very nice rooms, nice size TV. Good selection of food to eat for breakfast. Enjoyed my stay very much. I would recommen this hotel to every one I know.The people that work there are very helpful. 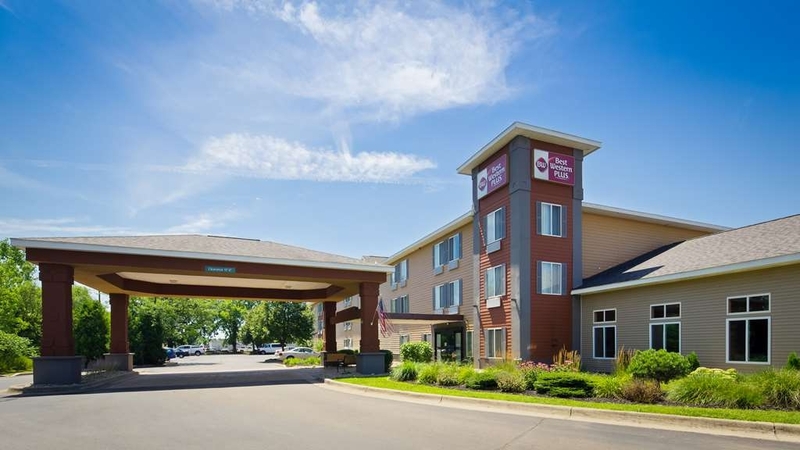 "My Favorite Hotel in Coldwater !!" I've stayed more than 10 times this past year. JESSICA and CASEY are both AMAZING and always here. They always know my name and are super sweet!! The hotel is clean, I love the hot tub and the breakfast is my favorite!! Tons of food options. I stayed in the Coldwater Best Western for a week while I was in town. Despite the pool not working most of the time while I was there, the hotel was fantastic, the staff was super helpful, and I have zero complaints about the room that we were given. Plus it was close to food and stores. After working and traveling on 10/30/2018. Arriving in the rain and cold my party and I was greeted by a police officer who was doing an investigation. Upon walking to the reception desk, there was a stench an odor that was noticeable in the lobby. The hallways were dimly lit. The rooms were dirty, had an odor and was poorly lit. I do not recommend, we moved out the next day. "Nice stay on birthday trip!" Celebrating my 77th birthday I decided to head North to Michigan. The front desk clerk was Shaun, if I remember right. He was very cheerful . He even wished me happy birthday 2 times. Gave us a room 109 just 2 doors down the first floor hallway. Very helpful since I have knee and hip problems. Room was great. Nice stay! "best price for hotel in the area we wanted to stay"
Stayed at this hotel for one night, booked in late ,booked online with Priceline around $60 odd, room was nice and clean and bed comfortable, hot tub and swimming pool inside the hotel was really nice.super breakfast with a lot of choices.would stay again. "Clean and quiet for a night"
This was a stopover on our travels. First of all it's hard to find. The sign is low and maroon. I thought BW signs were blue and yellow. You have to go between Taco Bell and KFC to get to it because it sits back from the road. It was quiet the lady at the front desk was very helpful. After a long day of traveling the hot tub was a nice bonus. The room was clean and the beds were very comfortable. We slept like babies that nice. The vanity in the bathroom was very large so you could spread out. The hot breakfast in the morning was good but it got pretty busy. Overall this was a great stay and I would recommend you give it a try. "Great place to stay if you are in Coldwater"
I stop here all the time when going to the prison to visit a life long friend. JT's down the road is great for ribs, a kfc and taco bell right in the parking lot, which make this a great place to stay at. Traveled with a large car tour, accommodate alot of people. Hot breakfast with egg crossiant sandwiches, waffles. The best sausage gravy for buscuits I have had. Amenities excellent, beds were very comfortable. Convenient phone charger locations right on nightstands. Thank you for the wonderful review! We were very happy to accommodate your group and hope to see you again next year! The Only good thing to say about this hotel was the free breakfast. Dirty floors, beds thrown together, blocked sink- required three request to unclog, poor service. Unfortunately you don't have many choices, but I would recommend staying somewhere else then this dirty, smelly establishment. Rate as a negative number if I could! "Everything great except the blanket"
Great place to stay. Very nice room. Great breakfast. Sorry I can't think of more things to say. I was there to attend a class reunion in the area. My cousin Phillip owns a coffee shop in the area and it is really great. It's called "Blue Hat"
Let's face it, this is Coldwater Michigan. You're not likely to find a michelin star rated place. 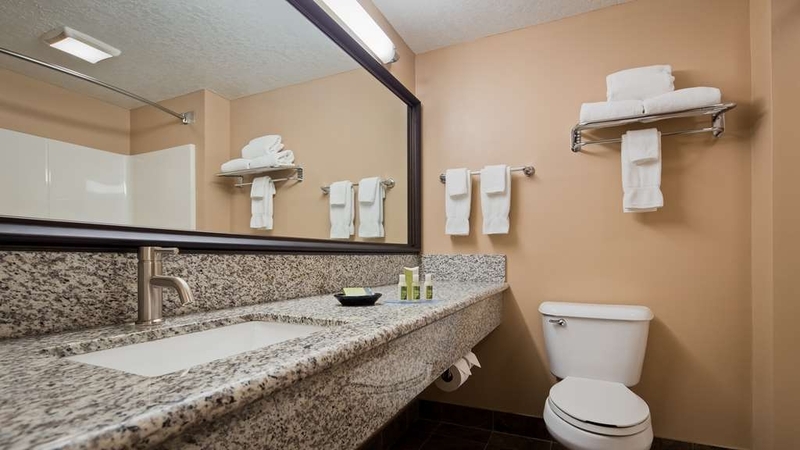 But as far as clean hotels go, you can't get any better than the Best Western plus. The rooms are clean and comfortable. The lobby and exterior spaces are well appointed. The breakfast is actually quite yummy, except if you get there too late people take bags full of their fruit, and they were frequently already out when I went down to breakfast. And now for the honesty part. I accidentally left my earbuds in the room. After frantically tearing apart my luggage, I realized I must have left him at the hotel and gave them a call. I spoke with a manager (Kelly?) who said that no buds had been turned in. I made some sort of flip comment like, "well, I hope the maid enjoy's her new earbuds". About 15 minutes later I got a phone call from the manager. She had tracked down the maid that cleaned the room and asked her about whether or not she had found the buds. She said she had, and lo and behold there they were. She had neglected to turn them in they were just sitting on her cart. The manager graciously put them in the mail that same day to me. Previously, I have left things in hotels before period and when the manager checks the lost and found if it's not there that's usually the end of the story. I give the manager here great props for investigating further and getting to the bottom of this. And only one negative. They allow smoking right outside the front door. Frequently it is obnoxious walking up to the entry. Surely, there is a another place to let people smoke that doesn't affect everybody comes to the hotel. Next time in Cold water, this is where I'll stay. It will become my home away from home. Thank you for taking the time to write a lovely review about your experience with us! I am glad I could find your ear buds and mail them out to you. I know if it was me I would want the same done in a timely manner as well. We look forward to seeing you when you are back in the area! "Not, not, NOT for the business traveler!" I was given a first floor room. The room itself was nice but the walls and floors obviously have no insulation because this is one of those hotels where you can hear every footstep in the room and hallway above. I got no sleep the night of my stay because three middle-and-grade-school aged kids were up all night (literally) talking, laughing, slamming doors and bouncing off the walls. I finally got the front desk person and the owner at 5:00 a.m. and the kids came to the door fully clothed and wide awake, Turns out the mom works the night shift and the kids are stashed in the room unsupervised. Totally unacceptable for the owner of the hotel to know about this but to allow the kids to be loud and unruly the entire night. So the Best Western Coldwater is this kind of hotel, more suited for truck drivers, construction workers, temporary laborers and down-on-their-luck single mothers. 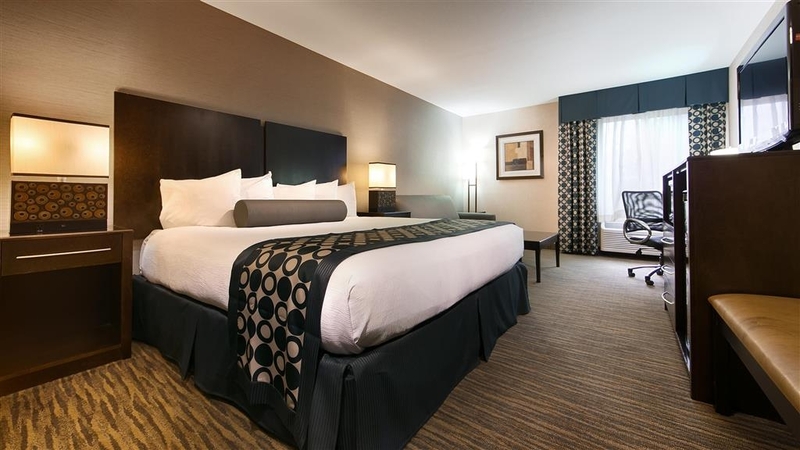 I stay in hotels 2-3 nights per week on business travel, but because of my experience here, I will avoid ever staying at another Best Western hotel. On a positive note, the front desk ladies were great and the breakfast was good, but if you are a business road warrior this is not a hotel for you. P.S. The entire parking lot needs to be professionally swept to remove the disgusting personal debris that litters it. We stayed here a few weeks back and had an eventful experience from the time we got there till the time we left. The front desk lady by the name of Laken was fantastic! She did a great job as she was extremely busy and keep her composure the whole time and handled everything in a professional manner. I hope they realize that she's a keeper! "Most Amazing Staff and Friendly, Beautiful Place!! " Hello, I am currently staying here 2 night. I rebooked last night for four more nights later in the month. I am picky. This hotel is so beautiful and the staff is so friendly. The breakfast was AMAZING!!! This is a great value and place to stay. The facility is great. But, the staff is awesome. 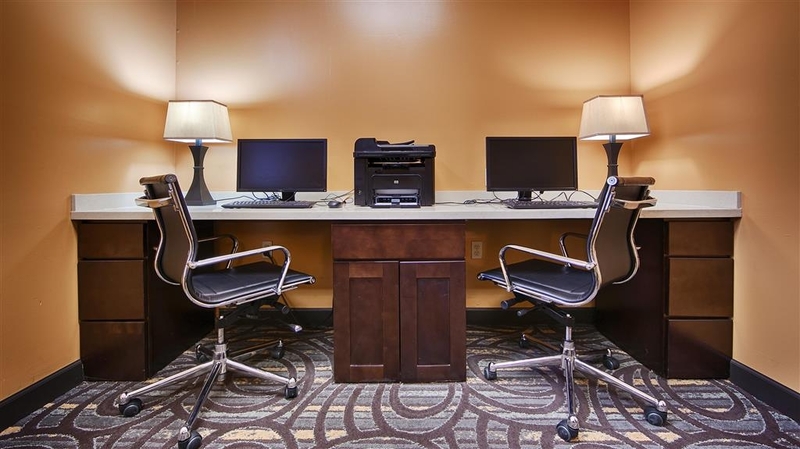 They are very attentive to your needs and go out of their way to make your stay great. They truly care. There is a very nice pool, the rooms are comfortable and the free breakfast is top notch. "Overall our experience was great, however, the toilets could certainly use an upgrade here." The breakfast was facility was top notch and much enjoyed. The king sized bed was very comfortable. Overall our experience was good except for the problem with the toilets. This unit does not have on premises repair staff after hours which presented a problem. We ended up booking here for our visit to the Hillsdale area based on the positive reviews. Hotel rooms seem to be scarce in that general area in addition to a pretty sizable track meet that weekend at the college, so we opted for the 25 minute drive over chancing it at a local motel. The staff, especially Front Desk, were courteous and welcoming. Our single King room was clean and beds were comfortable. Plenty of hot water and good water pressure in the shower and 3 sets of towels for the two of us in the room. Breakfast was better than expected and there were plenty of tables available in the dining area. We were a little concerned about the potential for noise when we checked in and saw a lot of kids in the pool area but heard nothing during the night. This hotel is a little hard to find as the other reviews stated but since I was aware of that, I used the Taco Bell as the land marker. Overall, I would definitely stay here again if I'm in the area. Let me start by saying the room was very nicely decorated and very clean. The bed was quite comfortable. I was very impressed. It is too bad that the great room was overshadowed by the front desk staff. We arrived in the afternoon and stood at the front desk for quite some time. We heard voices from the back, cursing and dropping the "F" bomb. I gather this employee was not happy with the housekeeping staff. Eventually, I guess they saw us on the camera and someone came out, apologizing she didn't see us. During the stay, if I needed to ask the front desk a question, I had to stand and wait for someone to appear from the back. Also, the front trash can was overflowing with trash to the point that is was falling out onto the front walk. It is shame that this really overshadowed how great the room is. Management needs to teach the front desk a little more about customer service. Check in was fast and receptionist was very helpful and polite. The hallway carpet seemed dirty and was very warm. Our room was very clean and the main beds were very comfortable. The mattress on the pull out bed left a lot to be desired. Two of our kids shared this bed and said it felt like laying on springs. We laid an extra thick blanket on top to try and make it better. The pool and hot tub were clean and pleasant. It did seem like there were not a lot of towels but staff did there best to ensure there were some available. The receptionist who checked us in helped us in another way too, and I have to mention it here. Unfortunately I did not get her name. We brought our 6 year old with us on this trip and she loves to swim. Unfortunately we forgot to bring her water wings. The receptionist let us borrow a personal set to use while we stayed. This was a total trip saver. Since the shallow end of the pool is 4 ft deep our little girl would not have been able to swim without water wings. Being able to use the water wings made her the happiest little girl in the whole place! Overall we had a great stay and will definitely recommend this hotel to others. I decided to stay here because of the high reviews and price. It really has beautiful rooms. I just walked into my room 202, I see a bug run across the white bed cover. I grabbed and smashed it will a Kleenex, took it into the bathroom, then took a picture. I Googled bed bugs, yep, it was a bed bug. I brought that bug to the front desk and asked for a new room.. I should have just asked for my money back, because I was up all night worried I'd feel bugs on me. No, I will not stay there again.. I don't care how nice the rooms are or how cheep. I can't do bugs. Zoom in on my picture. It's a bed bug! Without the bug I'd give this place 5 stars. Great time and excellent rooms. Front desk was empty most of the night. I'm from the area and the location was great but the entrance (along with taco bell and KFC ) is so not the best place. I loved my stay at this hotel. The room was easy to warm up and add on the jacuzzi, it was awesome!!!! "Good Value but not the cleanest"
"Great last minute place to stay"
We had to stay overnight as our house was without power. Check-in was very easy, the room was very clean, and the kids loved the pool. Our dog was welcome, and the shower had excellent water pressure. Thank you for taking the time to post your review! We greatly appreciate it and are glad you enjoyed your visit with us. We look forward to your return in the future! "if you prefer not sleeping the night"
Rooms are what you expect for the price, lots of contractors stay there so only quite tome is eleven pm to four thirty am during the work week. People drinking and some drunk in the parking lot. Catcalls to female guests multiple times. Stay away from this property. I would like to apologize for how your stay was with us. We no longer have this issue and we hope you will give us another try in the future. Hotel was clean and comfy. Staff was very pleasant, and complimentary breakfast had a little bit of everything to make us all happy. Their signage off E Chicago Road is very small, I missed it the first time I drove by, as I am used to something larger, and the hotel is set back from the road, but I'm sure that has something to do with zoning. Overall, I loved the hotel, and If I am ever in the area again, I will stay here without a doubt. Thank you for such a wonderful review! We look forward to your return visit! Our stay was so great. We needed a nice short getaway and I won't forget when going away again how well we were treated. The young lady at the front desk was so nice upon reception and when we left. You couldn't have had a much better employee to greet guests. One of the maids on the 3rd floor (315) went out of her way to get me a dolly to use for our leave. She was very nice and helpful. The pool and spa were an excellent addition and luckily we had it alone as I am handicapped and sometimes feel embarrassed. Thank You !!! What a wonderful review!! Thank you so much for taking the time to share your experience! We look forward to your return visit! Thank you for staying with Best Western! First time stay at a Best Western was in Coldwater Michigan and it was Excellent, beyond my expectations, from the reservation with the front desk, Jo, appearance and cleanliness of the property everywhere, to the room which was superb to the morning breakfast which was more than sufficient, including the sausage gravy, not just a bland white gravy. I would highly recommend it and plan on returning on another trip planned for next month and will anytime in the future I am in the vacinity of the property. Really truly enjoyed my stay. Hotel was fine for a one night. Unfortunately there was a large group of boisterous drinking men in the parking lot and down the hallways of our floor. Good breakfast sandwiches and courteous employees. When ever we are in the area we always try to stay at this hotel.We know what to expect and are never surprised by it.The staff are always friendly and helpful and try their best to make right anything that is wrong,which in our case has been never.It's a clean ,quiet place to stay. The staff at Best Western is friendly and accomodating. 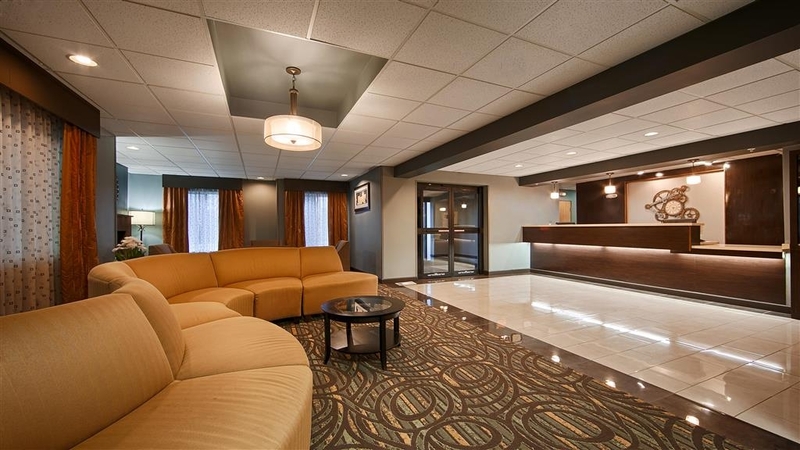 Although the lobby and rooms look a bit tired, the hotel is very clean. 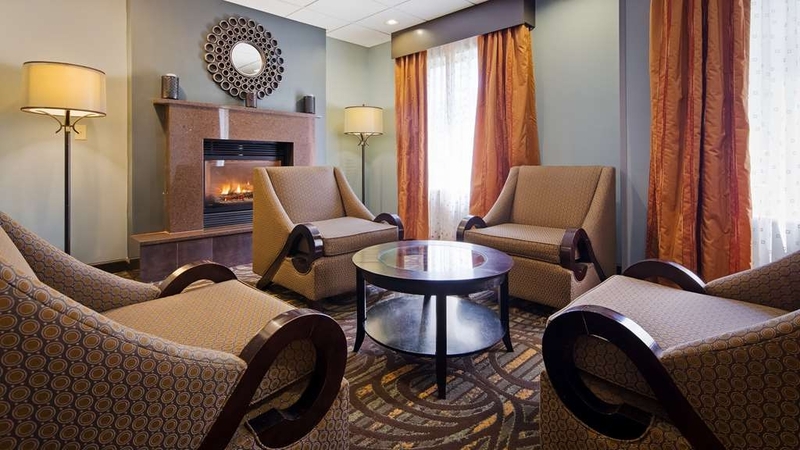 The friendly staff and affordable prices make this hotel worth choosing! "Great place in Coldwater, nearby Hillsdale"
My 2nd stay and it was clean, well run and enjoyable. There was a barking dog down the hall and management resolved the issue without a problem. We had two rooms and both were great. We did not stay for the breakfast, but it seemed like it was fine. We booked this hotel after the review given from other guests. Hallways and room were dirty and had bad odor. There were not adequate linens needed in room for sofa sleeper and when we tried to call the front desk, both phones did not work and we could not call down to the front desk. Service staff were polite and helpful. Breakfast was suitable but did not compare to other hotels we have visited. "Don't plan on using Internet"
This had spotty to NO Internet Service. We were unable to do our work. We were told upon CHECK OUT that we could have gone to the corporate website & connected thru there. Perhaps more money should have been put into getting more routers for the convenience of your guests to use the internet instead of remodeling the elevator. Nothing but CARBS on the breakfast buffet. Once you find the hotel, it a great place to stay. Very clean, well kept room. Staff was great, breakfast great. But we had trouble getting to it, as you cannot see the sign for it, it's too small. And you enter it from the parking lot of 2 fast food restaurants. Being next to the expressway I though they would have had a large sign to attract travelers, but that is not the case here. But otherwise a grat place to stay. "Great room after we moved"
We stayed here for Sisters' Weekend so we booked a two queen bed suite. We were very impressed with the size of the updated room and everything was clean. The problems came when the people in the room above us came home and started walking around. The floor/ceiling was very squeaky and it was so loud in our room it was difficult to have a conversation or sleep over the noise. There was someone walking around continuously until 1:30 in the morning and then again beginning at 5:30 a.m. I have never been in a hotel where you could hear the people above you so much. The next problem was our bathtub did not drain. When we reported it they said they had been having trouble with it. They put Drano in it but it still did not drain. Since we were staying another night we asked if we could be moved and they accommodated us by putting us in the room above where we were originally. The room was the same minus someone above us and the clogged tub. The next night was much more enjoyable and we were considerate of the people below us. The breakfast was very good and the price was right. I would stay again but only in a 3rd floor room. "Nice Clean Hotel, Great Breakfast! The price is right!" We stayed here for my daughters softball tournament. I normally would not pick a Best Western but this hotel has changed my mind! We also stayed here 2 years ago so I knew it was a nice clean Hotel. Small hotel but very nice and clean with great breakfast! The pool looked very nice too! It was the right price as the rest of the hotels cost much more in this area. Would definitely come back! We have had many events here. The staff is welcoming and helpful. The rooms are clean and inviting. The front desk is very atractive. The pool and party room were great. And the banquet room was a perfect size for our events. We have also used it for family coming to town, and for a fun night away for the kids. Thank you for your wonderful review! We look forward to seeing you in the future! The room was very nice and clean. The bathroom looked like new. Beautiful counters and fixtures. Had a king size bed and was very comfy. The breakfast was good with may options. I would stay here again. We visit Coldwater a few times a year and after staying at many different hotels in the area make this our first choice. 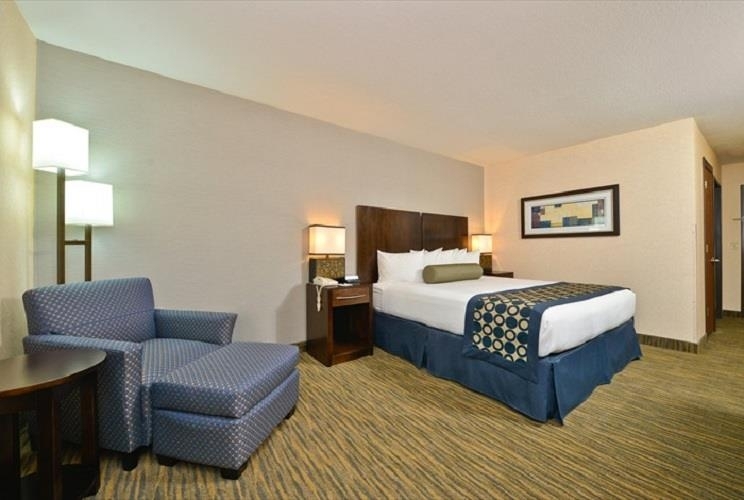 Nice indoor pool and spa, clean comfortable rooms, extensive breakfast bar, guest laundry, Very accommodating staff. We've stayed there in the winter with temperatures around 0 degrees. The hotel and pool area are always warm and comfortable, and the parking lot is plowed regularly during snow storms. The staff here was excellent, the room very well kept, the breakfast above the norm. I usually stay at Best Western when I can because of the mattresses they have. This Best Western was unusually well run and the breakfast was unusually good. Good management and staff makes a difference! Dear Valued Guest, Thank you for your review! I would like to apologize for the noise your brother had to experience while staying with us! 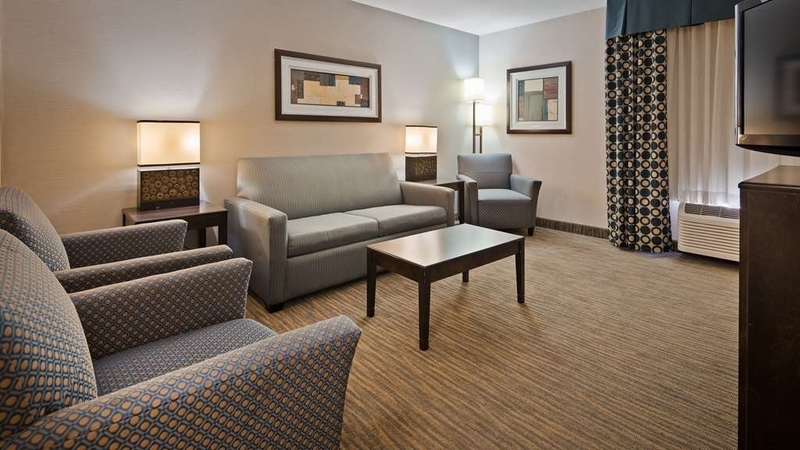 We definitely want all our guests to have nice and comfortable stay! We hope to see you all again in the future and would love to accommodate you! Again, I am very sorry, I hope you have a great day! Took our Granddaughters out for Princess Day "mini vacation" with Grandmas.Staff was so friendly and accomidateing.pool and spa was a perfect place to relax after a fun filled day.Hot Breakfast great variety. Had something for everyone's dietary desires.Thanks for all your efforts and making our stay so pleasant. Thank you so much for your great review! We are so happy you enjoyed your stay with your princess Granddaughters! I am so glad you all loved the pool and spa and got to enjoy it! Also, we are happy you enjoyed the delicious breakfast in the morning! We cant wait for you all to come visit again on your next mini vacation! We hope to see you soon! Overall the stay was pleasant. The hotel was a bit hard to find. The room was comfortable but the heating and air conditioning was noisy. The breakfast was slightly above average. The personnel were competent. "New staff need better training"
The shower was filthy. Upon reporting this to the day shift manager I was told that the housekeeper that was assigned to that room was new. I received a 10% discount on my stay. We have stayed at this hotel on an annual basis for the past three years and this was the first time we have had a problem. To be honest about the comfort of the bed, I very rarely find any hotel beds to be comfortable. Clean rooms, free wifi, great big indoor pool and hotub was huge. Beds not great for bad back but ok for a few nights. Breakfast was ok, wish they had more gluten free options - only option was Chex cereal. 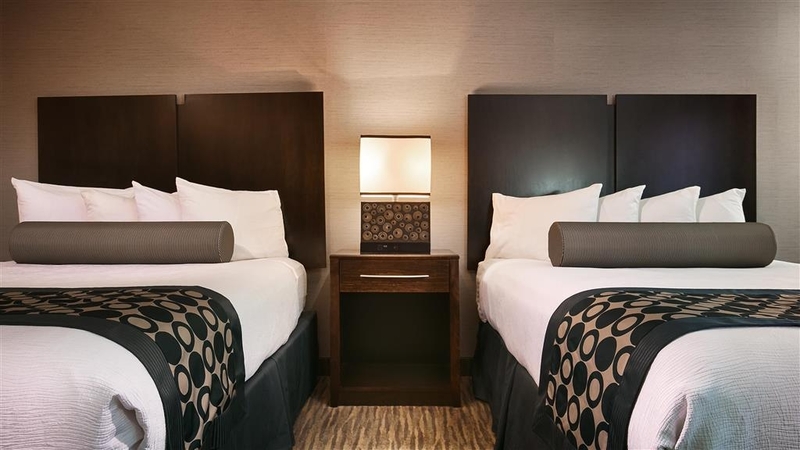 Great suite for family of 5-6 to sleep comfortably for a week. Thank you for the review. We are looking into more choices/healthier options and really value your feed back. We hope you stay with bus again when you are in the area. Brittney at the front desk was super helpful and accommodating. Housekeeping was friendly. Rooms were clean and well stock. Sunday breakfast was was a pleasant and delicious surprise . Many eating options surrounds this hotel. Will definitely be returning here. Thank you so much for taking the time to write a review on us! We look forward to your next visit with us! "Best hotel in Coldwater, MI." Casey (general manager) and staff are a friendly and helpful group. They always try to accomadate all of their guests (which can sometimes be asking ALOT of them). From the great breakfast in the morning to a mid-day swim in the pool to a late day walk on the fitness room equipment, this is a special place to rest your head (be it one night or many nights). Great location right off the highway. Great hotel! Thank you so much for an amazing review! We greatly appreciate it and look forward to your next visit with us! So glad we picked this hotel. The staff are wonderful, pool great and breakfast was amazing. Love that they are pet-friendly. The rates are comparable with the surrounding area. Give this hotel a try you won't be sorry!!!!!!! This is our second time staying here, and both times were good experiences. Friendly, helpful staff. The food was very good and presented very well. Check in was smooth as well as checkout. We will be back! Could not access internet with IPad. Phone worked. Was not an IPad issue. Has worked previously. Hotel personnel tried to help but there is only so much they can do with the system. If I was a business person I would have been extremely unhappy. "Very clean and reasonable rates"
This is a clean and very comfortable hotel close to restaurants and other services, just off the highway. It's a bit hard to find (GPS directions are wrong), so look for the driveway between the Taco Bell and the KFC. Staff are warm and welcoming and it was the BEST breakfast we had the whole trip, with delicious croissant breakfast sandwiches, each individually made and wrapped by the woman who lays out the breakfast offerings. The room was large and comfortable with great wifi. The exercise facility/pool looked very well maintained and inviting. I'd happily stay here again. Thank you so much for the wonderful review! We look forward to seeing you again on your next visit to Coldwater! Brittany and Josh really helped me out by hooking me up with this great jacuzzi room. Really goes back to childhood sayings treat others the way you want to be treated . They treated me like family and were great. Thanks for the help you two. Thank you for a great review! Josh and Brittney are a wonderful asset to our team! I'm so glad they made you feel at home! We look forward to your return visit!! My wife and I recently stayed here with our 3 oldest grandchildren 12, 10 and 6. We wanted to just find a place for them to swim and have fun.We had a 2 room queens suite with a sofa sleeper. A few days before we left, I called and asked for early check in. They didn't have that, but they said they would call as soon as our room was ready if it was before 3pm. Well they called about noon to tell us it was ready whenever we got there. we were still a couple hours away. But we thought that was really nice. Upon arriving, we got to our room (#327). It was really nice. When walking in, to the right was a nice size bathroom, with long counter and tub/shower combo. Next on the right was the bedroom with 2 queen beds. Very comfortable beds with plenty of room. To the left when entering was a micrwave and sink, then the "living room area". 2 chairs, sofa sleeper and coffee table, dresser and TV.Also a decent sized room. The only thing lacking was there was no table and chairs to eat at in the room. The pool area was nice, pool on the smaller side, 3' deep on one end, 5'deep on the other. Great for the kids. Also had a hot tub. Both heated. Kids had a great time. Breakfast area nice sized, food normal. Arriving at the hotel, the sign out front is very small. But as you get to Taco Bell, it right after that. The hotel sits back from the road a ways. We also heard that sometimes the hotel rents out the pool. Doesn't mention that on web-site, so you may want to call hotel to see if it is rented, if the pool is a priority for you. Thank you for the wonderful review!! We are so glad you and your family had a wonderful stay with us! We look forward to your next visit! "Previous stay at this hotel was excellent, not so much this time"
I stayed at this hotel on a previous trip through this part of Michigan. Perhaps it was right after being built or a rehab as I had a pleasant experience. This time I would say the property needs work. The rate was reasonable and the staff was helpful, but there were some issues. The area around the back entrance was dirty and butts all over the place. The door was rarely locked, as people propped it open with rocks. The parking areas just need a good cleaning and removal of bottles/trash. The room was clean but tired, e.g., refrigerator was dripping condensation, the hairdryer was maybe white with a coiled cord at some point but now smokey yellow and cord hanging all over. Also, the refrigerators have no freezers. The front desk will put your frozen items in the freezer at the front desk. The rooms are not very soundproof because we could hear the kids running in the halls and around the room above us. Most disappointing was Sunday breakfast. Standard cold fare but hot food was only biscuits and gravy. Nothing in the way of eggs, bacon, sausage, ham, or anything like that. I went to McDonalds. On Monday, they did have a selection of hot food. I couldn't tell if that was because the regular workers that stay here were back in town or not. Overall a reasonable property to stay at a reasonable price but could use a little TLC. Thank you for your review. I would like to let you know we are doing some upgrades here, the hair dryers are come down and being replaced with all new non wall mounted style. We are spring cleaning the outside areas, new mulch, rocks, flowers. Hopefully you will give us another try in the future. From the moment we walked in the door we were treated with disdain and contempt. The staff was unprofessional and uncaring and unfriendly. This was by far the worst experience we have had at a Best Western Hotel. Heidi, was unprofessional uncaring and rude. I would like to apologize once again for the issue that had occurred. If you would like to further discuss this matter please feel free to email me directly or call the hotel and ask for myself. 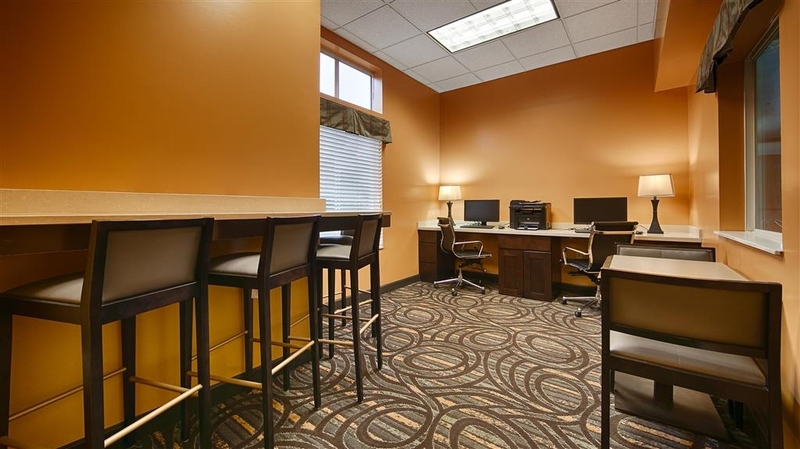 "Good location for south central Michigan"
This is a comfortable relatively new hotel with easy highway access and good parking with easy access to hotel. Good standard breakfast. All normal amenities for BW. Quiet at night, easy to get a good rest. Thank you for taking the time to write a lovely review! We look forward to seeing you the next time you are in Coldwater! 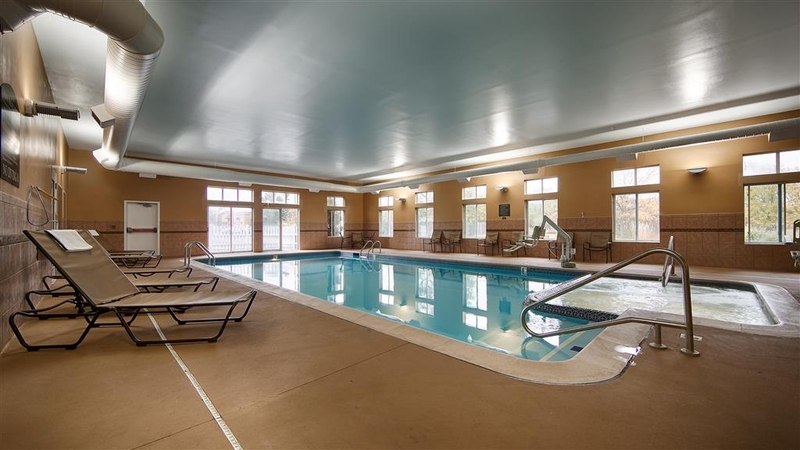 Very nice clean hotel at an affordable price.This is the hotel we always stay at when we are in the area.Never had a bad experience.they have a nice pool and hot tub. They offer a nice breakfast area with a variety of items.The only draw back is their access to the hotel,it's almost at a traffic light and at times can be a little tricky to enter. Thank you for your wonderful review! We look for your return visit on your next trip to Coldwater! "Hotel was nice for the price"
This hotel is nice for the price. The staff are very accommodating and the rooms are ok. The jacuzzi tubs are a little dated, but worked great. The hotel was a little loud; but with a birthday party and a wedding party celebrating....it wasn't that bad. Thank you very much for the great review! We appreciate your feed back and look forward to your next visit with us! Having come to town for a funeral my last concern was having to keep my belongings in my car. Housekeeping felt the need to "service and freshen" our room the day we arrived. Having checked in at 7am and returned from funeral at 3, noticed that personal belongings had been stolen. Housekeeping came in only to take the 2 pieces of trash and the hand towel out of the bathroom that had been used and helped themselves to our belongings. Upon notifying the front desk they were instant to defend their staff and never once followed up with me. I had to go to them to get answers and when the GM was notified I was assured I would be contacted when she got in the next day. So instead of being able to be with family and remember the life of our loved one I had to deal with them and not taking responsibility for employing thieves. We left the next morning and upon making an 8 hour drive my phone never rang. I again had to contact her for any follow up and all that was greatly disappointing as she was of absolutely a joke. When there was no investigation or inquiry into any video or formal "look" into the incident. "I asked and she said no nothing was taken." Please tell me who is going to admit to being a thief? If you choose to stay at this "renovated" yet poorly done location, DO NOT PUT ANYTHING IN YOUR ROOM IF YOU HAVE TO WALK AWAY FOR ANY TIME. HOUSEKEEPING WILL HELP THEMSELVES TO YOUR BELONGINGS! Hotel was very clean and updated. Breakfast was very good. Pool and hot tub had great adult only hours. Easy access to the interstate. Close to many restaurants. Front desk persons very helpful. Had great recommendation for dinner restaurant. Thank you for writing a review! I am glad you found the hotel to be very clean and updated and the front desk helpful. I happy to hear that you enjoyed the pool and was able to relax. We hope you come back and stay with us again! "REALLY NICE PLACE TO STAY..."
I always try to stay at BEST WESTERN'S because of the pet friendly and very reasonable rates, and I have stayed at a lot of them. This place is really nice and friendly staff. I would recommend this place for sure. Thank you for the wonderful review! I am so happy that you enjoyed your stay and were able to bring your pet. Thank you again for choosing to stay with us! We hope to see you again. "Great value... excellent place to stay." I was visiting Coldwater with a friend of mine for an overnight trip in November 2016. I decided to try the Best Western Plus based on the excellent TripAdvisor reviews and the price. Holy cow... I was not disappointed at all! It was truly an excellent place to stay for the price. I was rather impressed. The check-in process was quick and easy. The room we stayed in (304) was clean and comfortable. The pool and hot tub were nice. Breakfast in the morning was quite adequate... with a good array of hot and cold food choices. (I had scrambled eggs, a sausage patty, and hash brown sticks. Plus... the fact that they had vanilla yogurt was a bonus! Most hotel breakfasts have only non-vanilla yogurt flavors.) I would gladly stay at this property again if I find that I'm ever in the Coldwater area for a night. It seemed pretty modern... maybe either recently renovated or perhaps it had just opened within the last couple of years? It was pretty awesome. Wow! Thank you so much for writing such a fantastic review! I am so glad you enjoyed your stay and found your room to be clean and comfortable. It's nice to hear that you relaxed in our pool and that breakfast had a nice variety. We hope that if you are ever in the Coldwater area again you choose to stay with us again! We stayed two nights and would certainly stay here again. Staff was friendly and very helpful. It was quiet and our room was very clean. Remote for TV didn't work and within minutes it was replaced with another one. Only downside was our room card took several tries each time to open the door. Thank you for your great review! I'm glad you had a great stay and that your room was clean and quiet. It's nice to know that the staff was friendly and helpful. I am sorry to hear that you experienced problems with your room key, I wish we would have known and fixed the problem for you. Thank you for choosing to stay with us we hope to see you again! This hotel was clean and quiet. We stayed only one night passing thru but would consider staying again. We were very comfortable in the room and the bed was also very comfortable. There was a good breakfast selection and it was nice to have a free newspaper to read with our morning coffee. Felt like we were home. There was an affordable washer and dryer available. Thank you for writing such a great review! I am happy to hear that you were very comfortable in your room and that the bed was comfortable too. I glad you found the breakfast to have a nice selection. It's nice to know you felt at home. We home come and stay with us again! "Clean hotel with missing amenities"
Thank you for writing a review. We appreciate your feedback. I am sorry that you didn't have an additional bar of soap in your room, I wish you would have let us know and we could have brought one to your room. And unlike most robe hooks which are on the back of doors ours happens to be on the wall. I am glad you enjoyed the pool and hot tub! Thank you for bringing to my attention that the breakfast food was cold. I will make sure I check this every morning. I happy to hear the staff was friendly and the bedding was comfortable. We hope you come back and stay with us again. "Alittle pricey for the quality of the room and services." Nice Best Western. However for the area, and the quality of the room, I felt like it was a little pricey. The breakfast was wonderful, but everything else was at best average. The beds weren't great, but they were clean. The floors must have been weak, because every time someone walked around in the room above us it sounded like a herd of elephant's was fixing to come thru the ceiling! Made it very hard to sleep! The truck parking was a plus, and they do allow pets. Thank you for writing a review. I am glad that you enjoyed the breakfast and found the beds to be clean! I am sorry that you heard noise above you and had a hard time sleeping. It's nice to know that the truck parking was helpful to you and also that we are pet friendly. We hope you come back and stay with us again! Enjoyed our stay at the Best Western, Coldwater, MI. Our room was large with a king-size bed, and we had a couch, plenty of plug-ins for our computers and phones, and a very large vanity in the bathroom. Thank you for your wonderful review! I am happy you enjoyed your stay and found the room amenities to your satisfaction. We hope you come back and stay with us again! "Great place to stay with family or friends"
We had a 70th birthday party to attend for a close friend and we live an hour away so we decided to play it safe and stay the night. The hotel was very nice with large rooms and very clean. The pool area was very inviting, although we did not have time to use it. The staff were friendly and helpful. Thank you for your review! I hope everyone enjoyed the Birthday party! It's nice too know you found the hotel very clean and the staff friendly. Maybe you can enjoy the pool next time you stay. We hope to see you soon! The hide a bed was in terrible condition, like sleeping on springs. We tried to close the bed and sleep on it as a couch. It was completely jammed and would not even close. It was unusable! We called for a roll a way, and there were none at the hotel. We asked for another room, and there were none. We had made the reservation weeks ahead. The staff could do nothing to help us with the bill as they had no authority, and they were not allowed to call management on a Sunday. Two of us slept on the floor after a long day of moving my daughter into college. There were ants on the floor and the bathroom sink would not drain. We are waiting to hear from management. Thank you for writing a review. We have spoken on the phone since you posted the review and I hope we resolved the issue to your satisfaction. Again I apologize for the inconvenience we may have caused. I was not happy with the quilaty of the food service. The bisquets were stell and the eggs were poorly made. the ac in the room would not go to fan only and was nosiy The stay was ok for the most part just not real happy with it. Thank you for your review. I am sorry to hear that you were not happy with the breakfast food and that the AC unit was noisy. I wish I had known and we could have offered you other options for breakfast and we could have fixed the AC unit or moved you to another room. Again, I apologize and I hope you give us another try! "Over all great. Some Staff was UN professional!!" Upon arriving, all was swell. I entered the lobby and no one was at the front desk. I then heard what appeared to me yelling and cussing at sounded like towards the staff. i then asked the lady at the desk (when she finally came to the desk) who that was and if all was ok, she proceed to tell me that it was the "GM" and that she is that was all the time and to excuse her. how embarrassing. breakfast was good. A lady named Amanda, cleaned my room and did an outstanding job. She had very nice appearance and loved the cleanliness of my room. all in all a good stay, other than the un professional joke of a boss that those poor people have to endure working with. i understand, jobs get stressful and employee's tend to not have it "together" but keep it classy! Thank you for writing you review! I am deeply concerned about this situation as I am unaware and caught off guard by this. We all have frustrating days and unhappy situations but I have never used foul language or raised my voice in anger at any of my employees. Again, I would like apologize for any unprofessional behavior you may have heard. Thank you for letting me know what a fantastic job Amanda did. She does a great job! Stayed one night traveling from Michigan to Ohio. Place was very hard to find, even with GPS. Sign on the main street was very tiny. Room seemed clean and spacious and we were upgraded to a suite at no charge. Hot breakfast was good. Have to say that parking lot did not give us a "safe" feeling with people loitering outside smoking and drinking. Very nervous about leaving our luxury car there. Front desk was helpful, except when we reported the loiterers. Price was good, when compared to the area. Not sure we would stay there again. Thank you for your review. It's nice to know you found the hotel to be clean and breakfast good. I do apologize for any unpleasant experience you may have had. We strive to make sure all our quests feel safe and secure. Thank you for your feedback and we certainly keep on top of this in the future. This is a nice hotel in a quiet location. The hotel is clean, breakfast is great and the pool area was wonderful. Staff was very nice and helpful. Stayed two nights and ended up in the same room both nights. I am what one would call a hotel snob and I would definitely stay here again. Thank you for your fantastic review! I am happy you had a great stay and the staff was friendly and helpful. Hope to see you again! The hotel is very Friendly. I traveled back to Michigan from California with my 4 boys and our cat. We had no problems with checking in or out. The room was great. I did a load of laundry and took the boys swimming. Thank you for your wonderful review! I am happy you found the staff friendly and encountered no problems during your stay. We hope you come back again! 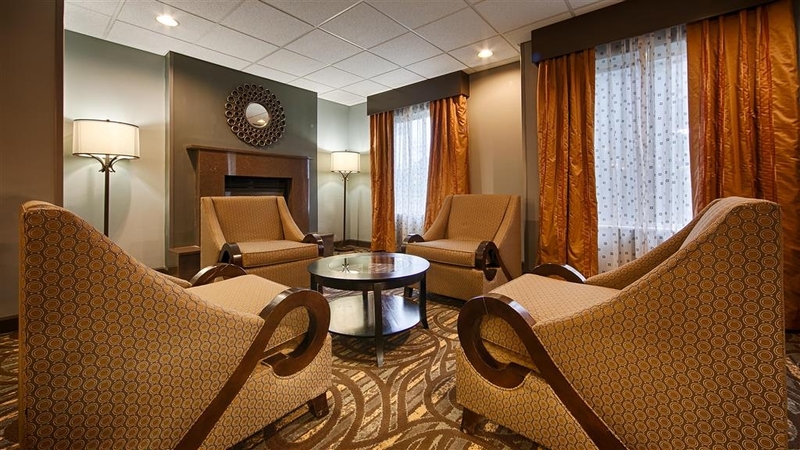 As a regular Best Western guest, I found this Coldwater hotel to be very nice at a reasonable price. Decor is contemporary and fresh, everything worked well. Breakfast was ok, nothing outstanding. Front desk staff friendly and helpful. Near several restaurants including a Culver's, open to 11pm. I would return to this hotel if in the area again. Thank you for your nice review! I am happy to hear that you found the hotel fresh and reasonably priced. We hope you stay with us in the future. I pulled in around 7:00pm to check-in. There were 8-10 men hanging outside the front door smoking and drinking and from the sounds of it they had been drinking for quite some time. When I was walking up to the front door, a large SUV pulled up and a lady got out and from the sounds of it was propositioning for a "date" that night. Not the kind of environment I am used to staying in (140+ nights/year in hotels) nor that I would stay in the future (thus the title, First time, last time). The young lady at the front desk was very courteous, smiled, and was prompt with check-in. The room was average in terms of cleanliness. I pulled the bed sheets back to inspect the mattress and there box springs was loaded with what appeared to be years of human hair, dust, etc. The sink and tub did not drain properly (the sink took over 5 minutes to drain) which tells me that there is minimal attention paid to housekeeping (sink drainage is easily correctable). One of the downsides to staying in Best Western Hotels is the lack of consistency between different properties and the reason I don't use BW much. Thank you for writing your review. We appreciate your feedback and will use to improve our guest satisfaction. Nice hotel- Very Clean. Friendly helpful staff. Hotel driveway is a little awkward . But overall hotel excellent just off expressway. Nearby shopping, Restaurants and Gas stations. Swimming Pool. Breakfast included. Thank you for your review! I am happy you found the hotel to be very clean and the staff friendly and helpful. I agree the driveway is a little awkward but hopefully with the new signage it will be easier to find. Thank you for choosing to stay with us! The hotel is kept in good condition. Always clean and comfortable. Heating/cooling works well. It's the staff that really makes the place home though. Ashley W. at the desk is always very friendly, professional, and helpful. I always feel she goes out of her way to make the guests feel welcome. There are a few hotels in the area, but month after month, I choose to stay here. Thank you for your great review! It's nice to know that you always find the hotel to be clean and comfortable every time you stay. And I agree Ashley is a joy and fun to work with! I am glad you choose to stay with us while in the area. See you soon! our first stay this location. Late arrival but the staff was so kind and friendly. Place is clean and comfortable and quiet. We will recommend this location to other family members who don't stay at the lake house for our next family reunion. fast internet and good breakfast. unfortunately, didn't get a chance to try the pool. Thank you for writing such a nice review! I am happy you enjoyed your stay and that you would recommend us to others. Sorry you weren't able to try the pool. Maybe next time. Hope to see you again! The room was spacious, clean and very 'fresh' feeling. The staff was helpful in getting our room ready when we arrived early, or they tried to do it but we needed to wait. They gave us a good recommendation for lunch in the old Coldwater Train Station and it was yummy. In a good location next to the highway with lots of restaurants nearby. Just a bit tricky pulling out of the parking because it is so near the highway interchange, but the locals were friendly and helped us turn left every time. Thanks people of Michigan! Thank you for your great review! I am glad you found your room clean and fresh. I'm happy to hear we were able to help you in finding a "yummy" place to eat. It's wonderful you enjoyed your stay and we hope you come back again! We checked in around 2 am and had no problems at all. Staff were friendly and helpful. Thankful for the indoor pool as it kept my 8yo son busy during the day while my husband had to work. We had to check out for the weekend because they were booked and that was ok because we made the reservation at the last minute. Most hotels in the area were booked so we ended up at a less desirable hotel for 3 night. However after the weekend we will be checking back in for 8 more night. 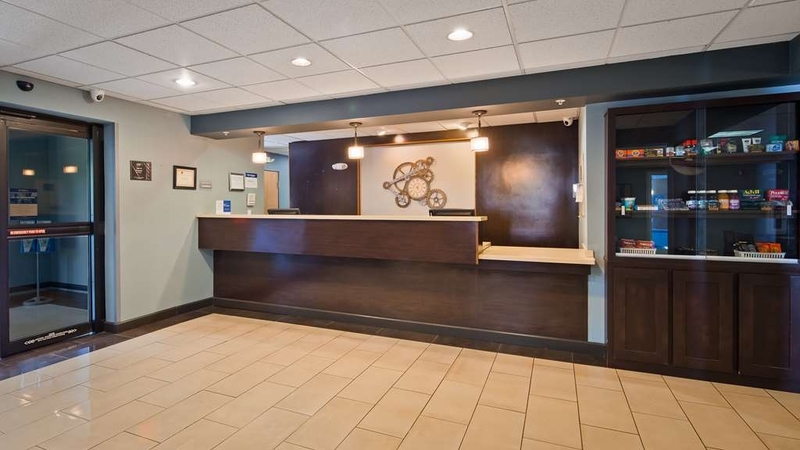 Hotel is clean and they have a great breakfast with lots of hot items and even have laundry facilities for this of us who stay more then a couple of nights. I would recommend this hotel if ur in the Coldwater area. Oh I forgot to mention, since they were booked for the weekend and we had to checkout they allowed us to stay until 1pm on check out day. Extremely grateful for that. Thank you for your wonderful review! I am so happy you enjoyed your stay. I'm sorry you had to leave because we were full but glad you came back! It's nice the pool helped you with your 8 year old son and kept him happy. We hope that if you are ever in the area again please come and stay with us again! Thank you for writing such a great review! I am happy to hear that we resolved your problem with your room right away! I am glad you found the room to be clean and comfortable and breakfast to be good. We hope you come back and stay with us again! "No minuses at Best Western Plus"
There is nothing bad (and everything good) to say about this hotel. Check-in was fast and friendly. The room was modern, well-decorated, and perfectly maintained. The bathroom has a large amount of counter space. I always check out the shower in hotels to see if there is any mildew on the grout. It was pristine with not even the slightest trace of any mold or mildew. The breakfast was similar to other chain hotels, but so neat and tidy. Not one spill or mess to be seen, even with a busy breakfast morning. This is a great place to stay. Thank you! Thank you! What a fantastic review! We are so happy you enjoyed your stay and you found the hotel to be clean. 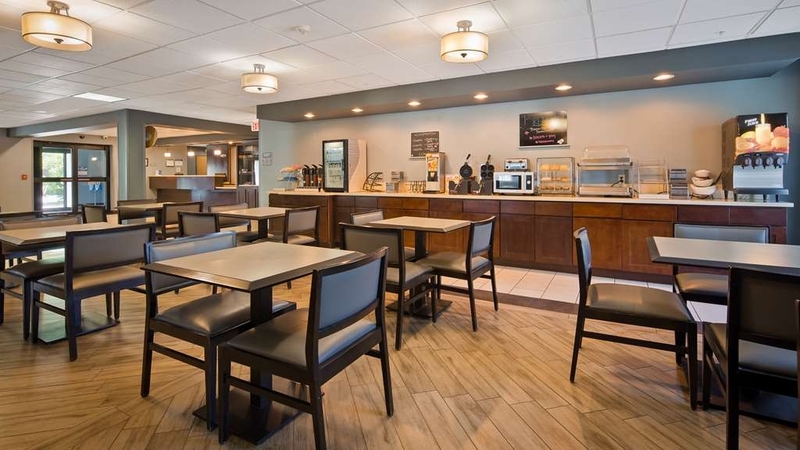 It's great to hear that the breakfast area was clean and well maintained. We hope you choose to stay with us again if you are in the area! Nice motel, hard to find....you can hear people walking above you. Very squeaky floor. Always stay in Coldwater before the June nascar race, it is very close. I would stay again. It is off the road a ways and very small sign, it took a couple turn arounds to find it. "Good quality for a great price"
Good quality for a great price. Stayed here for a couple of days whiles on a businesstrip. Good service, clean room and moderate breakfast. More than enough free parking in front of the hotel. Would definitely stay here again. Thank you for writing such a nice review! It's great to know the service was good and your room was clean. Thank you for choosing to stay with us and we hope to see you again! We were visiting colleges and found this hotel on priceline. Got two rooms each with 2 queen beds. Stayed on the third floor. The staff was wonderful as we checked in very late. The rooms were very clean large and comfortable. The bed and pillows were one of the best. This is the best Best Western we have stayed in. Kids loved breakfast sandwiches. Highly recommend this hotel. Thank you for your wonderful review! We are so happy that you chose to stay with us while visiting colleges in the area, that can be stressful enough! I am glad you found the hotel to be clean and comfortable and that the kids enjoyed the sandwiches! We hope you stay with us again! "THE BEST PLACE TO STAY IN COLDWATER!!!" This Hotel is by far one of the best that I have ever stayed at! 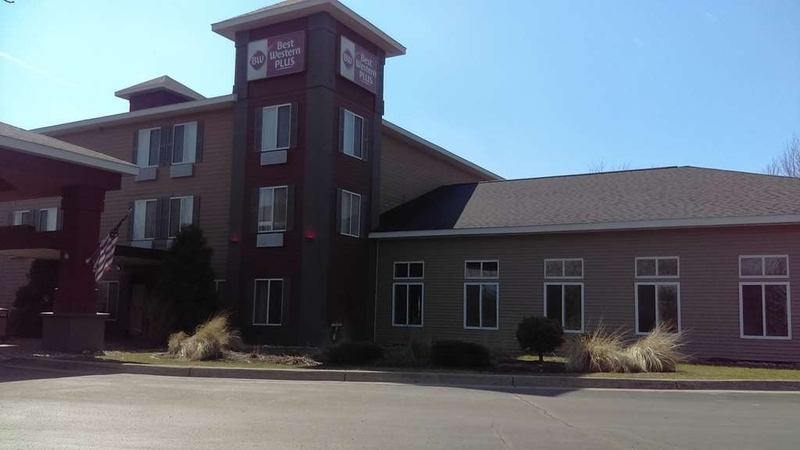 I travel all over MI for work and I have never found a better place to stay, the staff is the best, the rooms are excellent, the beds are comfy, and the hot breakfasts are delicious! I will recommend this hotel far and wide. If by chance you read a negative review about this hotel don't believe it because some people can never be pleased, this hotel is EXCELLENT!!! Thank you for writing such an amazing review! It's wonderful to hear how much you like our hotel. 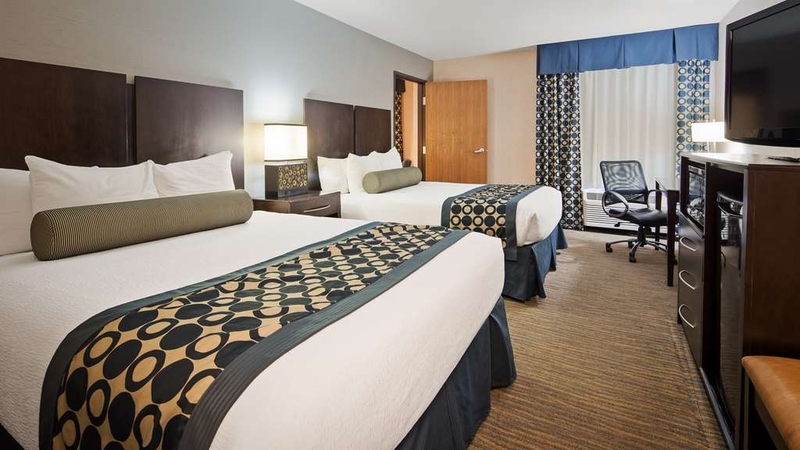 We appreciate you choosing to stay with us while on business in the area. We hope we continue to do an excellent job! We hope to see you soon! I've stayed here twice while visiting friends in the area. The first visit was spot on - everything was perfect. Pool was lovely, staff was fantastic, the room was clean and comfortable. The second time I stayed here, I had a few problems. The remote for the TV wasn't working, the electrical outlet in the bathroom was dead, and the ventilation fan in the bathroom was also non-functioning. Each issue was managed immediately and effectively. I do find it a little expensive here, but I can't deny that you get exactly what you're hoping in a hotel here. It's a great choice!! Thank you for writing a review! I apologize for the problems you encountered during your second stay. I am happy to hear that everything was taken care of for you right away. Thank you for choosing to stay with us! We hope to see you soon. 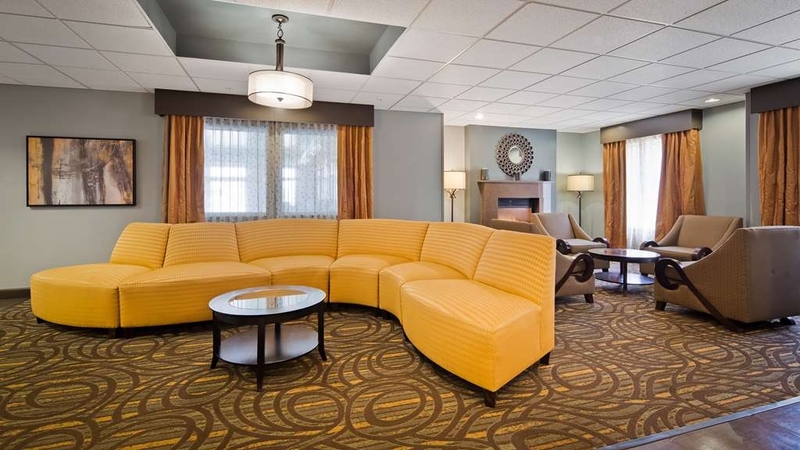 "Best Western is my favorite"
I had to go to Michigan and though it was 35 minutes away from the drug rehab center I work for, Narconon, I chose to stay at a Best Western as I know what I am going to get and don't have to worry, plus the price is always good. Again I wasn't disappointed. BW is the BEST hotel. Thank you for your great review! It's nice to know you trust the BW Brand. We hope you come back and stay with us again! Everyone was Fantastic!!! Very accommodating!!! Rooms were very clean as well as the pool. The food was great !!! Lots of other places to eat after breakfast. Can't say enough about how happy we were there. Will stopping in again. Thanks for a wonderful stay!!! Thank you! Thank you! Wonderful review! It is so nice to know that everyone is fantastic and very accommodating. I am happy you found the rooms and pool to be very clean and you enjoyed breakfast. We hope you come back soon! This hotel is a gem! I have stayed here on several occasions for work, it is always very clean, the hotel staff is one of the best that I have ever dealt with, they are very friendly and willing to bend over backwards to make your stay the best experience to be had! I will continue to stay in this hotel whenever I am in the area. Thank you for writing such a wonderful review! I am so happy to hear that your room is always very clean and the staff is friendly and goes out of their way to make your stay the best! We are so glad you will continue to stay with us while in the area! We hope to see you soon! This hotel was very nice and very clean. Our room was very comfortable and we did not have any issues. I did notice when checking in that my ID was not checked I found that to be odd. I do think that the hotel needs better signage when getting off of the highway I drove right past it because I did not notice the vey small sign in between two fast food restaurants. Overall our stay was very relaxing and enjoyable. Thank you for you great review! I am glad you found the hotel to be nice and clean. I know we are a little hard to find and our sign is small but I am happy you found us! We are getting a larger sign by the road so hopefully that will help. Thank you for staying with us and we hope to see you again! I am so impressed with Best Western motel in Coldwater, MI. From this point on, I will only stay at Best Western. Melissa was very friendly and knowledgeable at check in. I have to say Ruth the housekeeper who cleaned our room prior to check in did a wonderful job. She not only passed my inspection she went out of her way and wrote a cute note and drawled a spring flower on it. Loved it! When we were leaving our room I passed a housekeeper and she greeted us with Good morning and I asked her if she was going to clean our room, she said no; she was cleaning the other side. I asked her, name and she told me that she was Ruth. I thanked her for our kind thoughts and she said Happy Easter. Wow! what a great employee you have and she should be rewarded for her upbeat attitude and awesome work. Wow! What a wonderful review! It is so nice when guests recognize our team members for doing a great job! Thank you for recognizing Melissa and Ruth! I am happy you found your room clean and enjoyed your stay. Please come back and stay with us again! Room was clean and nicely decorated. Bed was comfortable. There was a big variety of TV channels. Also a big variety of free hot and cold breakfast food. Large parking lot. This was a very pleasant experience. Thank you for writing a review! It's nice to know you found your room to be clean and the bed comfy! I am glad you enjoyed breakfast and had a pleasant experience. We hope you come back and stay with us again! We had wonderful service on our little getaway to Best Western! The staff was great and very accommodating! The breakfast was great and featured a breakfast sandwich that was a first for us and it was delicious. The only problem we had was the jacuzzi in our room had hair in the filter and looked like the filter bd not been being cleaned. We filled the tub up and had multiple balls of hair floating in the tub. Besides this incident we had a great time and would stay again if the opportunity came about. Thank you for your great review! I am happy to hear you had wonderful service and the staff was accommodating. I glad you enjoyed the breakfast sandwiches! Thank you for bringing the Jacuzzi to my attention. I will definitely look in to it. It is nice that you enjoyed your stay and we hope you come back and stay with us again! The shower drain was extremely slow. I felt like I was wading in water versus taking a shower. There were also several stains in the carpet. Would I stay here again yes because there aren't many options in the area. Thank you for writing a review. I appreciate you bringing this to my attention. We strive very hard to keep the hotel in great working condition and as clean as possible. Sometimes things are accidentally missed and I do apologize. I have talked with all the team members and by working together we will strive to make the proper corrections. We hope you will consider staying with us again. "Clean room & decent pool hours"
My two sisters, my daughter, & I stayed here on a Sun. night- Tues. morning while on a road trip to Hillsdale College for my daughter's music audition. We requested a pet-free room for my sister with allergies and were very pleased with the cleanliness. A pool is important to me so I especially appreciated the pool staying open until midnight. I also liked that it was a decent size & depth so I could exercise in it. I really enjoyed the hot tub as well & could shower off before returning to my room. The staff was friendly. Not sure how it would be if it was crowded, thankfully just missed the parent weekend the day before. I plan to stay here in the future during visits when my daughter starts college next fall. One issue we had tho, when we arrived at night we had trouble finding the entrance as it is tucked behind the Taco Bell. We mistook the exit road to the highway as the driveway and had to drive quite a bit before being able to turn around. The sign is small at the road and easy to miss if you don't know where to look. If you arrive after dark just enter as you would for Taco Bell. Thank you for writing such a wonderful review. I am glad you chose to stay with us while visiting Hillsdale College for your daughter's audition. I'm sure she had a great performance! I am happy to hear that you found the hotel clean and allergy free for your sister. We do get quite a few great comments on our pool and hot tub and that there is swimming for adults only after 10pm so they can sit back and relax! And yes, you sure just missed a busy weekend with all the parents coming in. I'm sure you will be one of them in the future. It's nice to know the staff was friendly and courteous. And again we get a lot of comments about how hard it is to find us. We are getting a new large sign by the road so hopefully that will help. If you need to make future reservations you can contact the hotel directly and we'd be happy to help! Thank you again for choosing the Best Western plus Coldwater Hotel! We hope to see you soon! 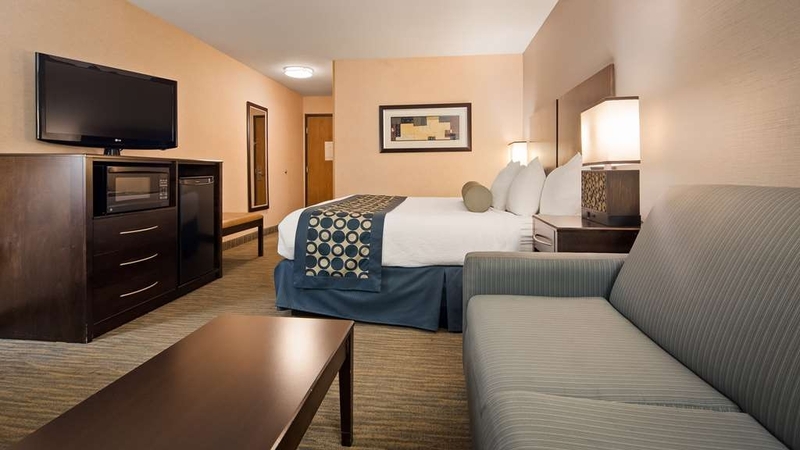 Very clean and comfortable hotel with friendly staff and great service. Rooms are updated and ammenities ae decent. The exercise room is small but adequate for some cardio. The breakfast was above average and the hotel was quiet. Thank you very much for writing a review! It's wonderful to hear that you found to hotel to be clean and comfortable and the staff friendly. 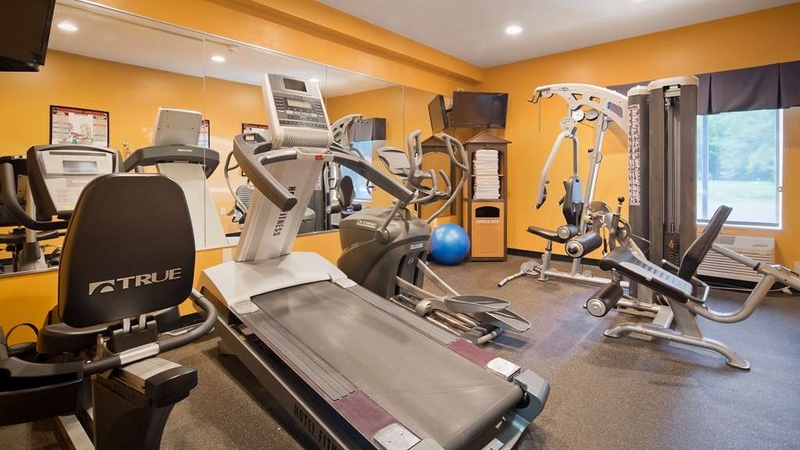 I am glad you liked the amenities and the exercise room. It's great to hear you enjoyed breakfast and the hotel was quiet. We hope you come back and stay with us again! Enjoyed our stay in Coldwater. Room was large and very clean. Beds were awesome comfortable, Pillows were large and fluffy, 4 pillows to a bed Pool and hot tub are very nice. Halls were very quiet even though there was a lot of quests. I will always stay at this hotel. When I come to Coldwater. Service desk staff was friendly Lots of restaurants near by. Thank you for the great review! I am so happy you enjoyed your stay! Nothing beats a comfortable bed and fluffy pillows for a good night sleep, especially when away from home. I am glad the front desk staff was friendly. It's very nice to know that you choose to stay with us while in Coldwater. We hope to see you again soon! This is a fairly standard Best Western Plus and we like the Plus and Premier, but the staff was way above standard. They made our small group feel like we had booked the whole hotel and went out of their way to make our stay great. We would definitely come back. Thank you so much for your wonderful review! 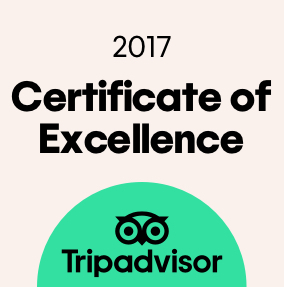 I am very happy to hear that the entire staff made you and your group feel special. We truly enjoy what we do and that's to make sure all our guests enjoy their stay! We hope you and your group will come back and stay with us again! This hotel was beautiful. The staff were friendly. The room was magnificent. My grandkids loved the pool. We loved are stay there and definitely would recommend this hotel to friends. We can't wait to go back again. Thank you for your "magnificent" review! It's a great honor that you chose to stay with us for your family get together. I am happy to hear that you found the hotel to be beautiful and that your grand kids enjoyed the pool. It's great to know that you will recommend us to others as well! We can't wait to have you stay with us again! We really needed a relaxing getaway and we found it here...the whirlpool tub was delightful the room was spotless and the pool was warm ! We did not enjoy the boys running up and down the hallway, but that was poor parenting...an American epidemic. .. Thank you for your great review! I am happy you enjoyed your "getaway for 2". It's nice to know you found the hotel to be clean and hot tub relaxing. Please come back and stay with us again! Other than a woman that can't read signs and her obnoxious kids, we had a great time. It was relaxing and very nice. We enjoyed the pool and hot tub and the suite was very roomy. The staff was very polite and helpful. The overall appearance, quality and cleanliness was very good. Thank you for you nice review! I am happy you enjoyed the pool and hot tub and that your suite was roomy! It's nice to hear that the staff was polite and helpful. I am happy you enjoyed your stay and hope you come back and stay with us again! Great breakfast, nice service. Work out room is too small and was freezing. Room was totally fine. Near good restaurant fast food options. Jimmy Johns. Pool was nice and not freezing. Hot tub was great. Front desk lady was nice. All in all was a plus. Thank you for writing a review. I am glad you enjoyed breakfast and that your room was good. It's nice that we were conveniently located near restaurants to fit your needs. I am glad you enjoyed the pool and hot tub has well. We hope you stay with us again. The updated contemporary décor is very attractive. The beds are comfortable. The wifi works well. The staff is very friendly and helpful. The breakfast was great. I appreciated having boiled eggs available at breakfast. Thank you for your review. It's nice to hear that you found the hotel decor nice and the beds comfortable. I am glad the staff was friendly and that you enjoyed breakfast. We hope you stay with us again! I took my spouse on a weekend get-a-way that was about a 4 hr. car ride from our home to an area of her choice. This hotel was close to several shoppes and points of interest for both of us, not to mention the beautiful countryside along the way. Thank you for writing a review! I am glad that you chose us for your "get-away" and that our location was just the right spot for your entertainment choices! And I must agree the country drive is truly amazing! We hope you stay with us again. The hotel was a very nice place to stay while visiting Hillsdale College. 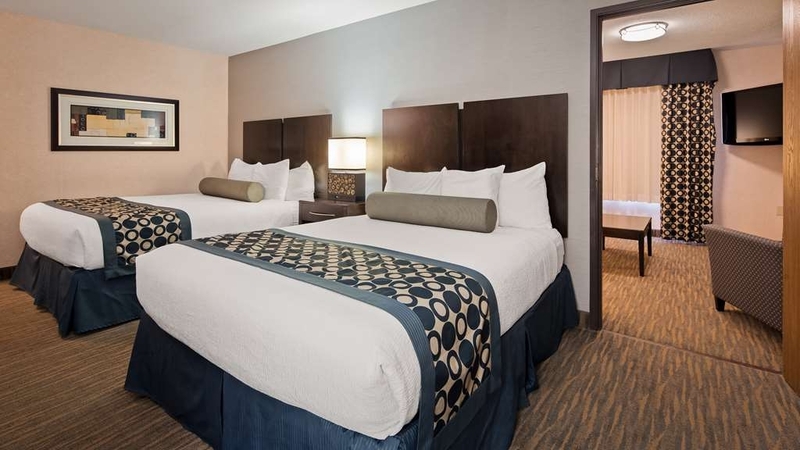 It is a little distance away from campus but it is worth the drive when comparing this stay to others in Hillsdale. The Hotel was very clean and the staff was very pleasant. We will stay here again. Thank you for your great review! It's nice to know you enjoyed your stay and found the hotel to be clean and the staff very pleasant. We are a little bit of a drive to Hillsdale but I am happy to hear that you will stay with us again! We hope to see you soon! Picked this location for the antique shops in area. Night before we are to arrive dad (86) and develop my disabled brother decide they will go with us. First time traveling with them in many years. Called to get them a connecting room, reservations state they will do their best. We arrive very friendly at front desk, connecting rooms no problem. All settled in dad needs to use restroom and has difficulties, never thought to ask for accessible room. Talking at breakfast (free) decide to talk to front desk. No problem, moved from our rooms to connecting rooms with one accessible. Very clean as others were. Our new home in this area. Thank you for your great review! 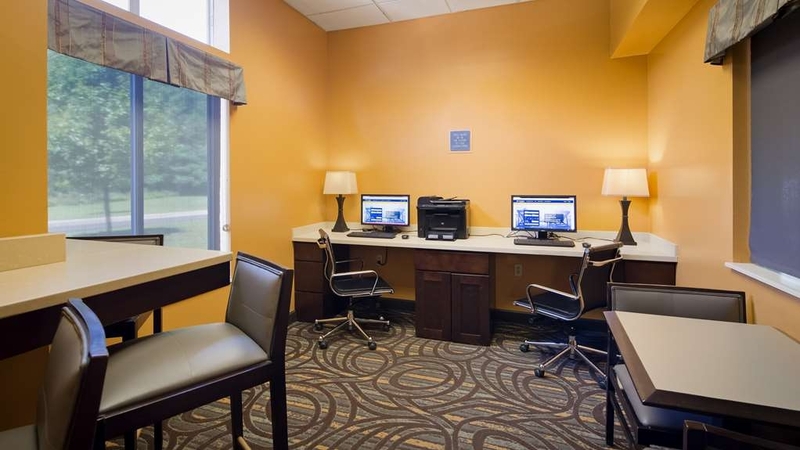 I am so happy we were able to accommodate your needs when traveling to the area. I am glad you found your room to be clean and the staff willing to do whatever it took to make your stay great! I hope you enjoyed the antique shopping in the area! Please come back and stay with us again! "Clean, comfortable and room to move!" The best Western Plus in Coldwater, MI is the only hotel in town that I stay at. The beds and pillows lead to a night's rest where you don't want to get out of bed because it's so nice, but when you do you are refreshed and ready for your day. 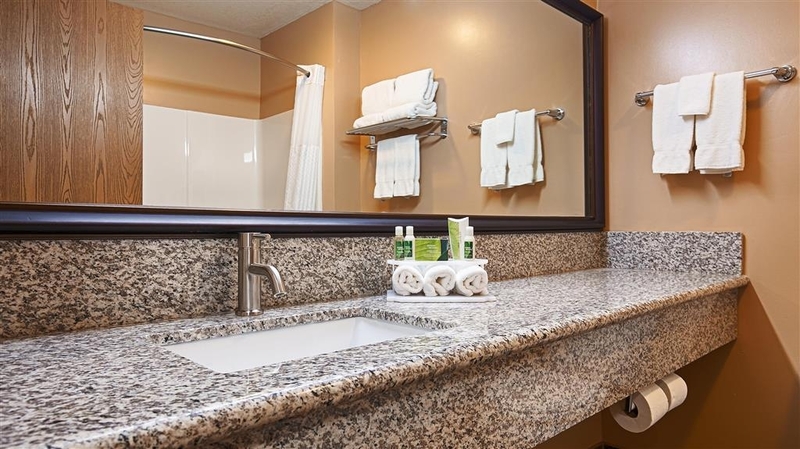 The bathrooms are well kept, spacious and have nice hot showers under a spa style shower head. And best of all, the staff is beyond helpful and treat you like you're family. The newly redone pool/hot tub area is pretty fantastic too. Highly recommend! Thank you so much for your fantastic review! I am so happy to hear that you feel like family when you stay. I am also happy to hear that you get a wonderful night sleep and wake up refreshed and ready to start your day! Thank you for choosing to stay with us when in Coldwater! We hope to see you soon! Stayed here for business. Located right off of the highway and convenient to food and shopping. The room was quiet and clean. I would stay here again when driving through Michigan. The front desk attendant was very nice and provided some suggestions on where to eat dinner. Thank you for your wonderful review! I am happy that you enjoyed your stay and you found the hotel to be clean and comfortable. It's nice to know the front desk was helpful. We hope you stay with us again when coming through Michigan! This Best Western is right in the middle of an antique area. We were there to visit with family in Hillsdale and look at the college there. There's plenty of beautiful scenery of Michigan, especially in the fall. It's a very convenient area to stay in. Thank you for writing a review! We are near what is considered the "Antique Capital" of Michigan" which is Allen. Michigan is quite beautiful in the Fall with all the brilliant colors. It's nice to hear that you chose to stay with us while visiting family and Hillsdale College. We hope you come back and stay with us again! "A Great Stay in Coldwater"
We arrived around 8:00 with no reservation - just decided to not drive all the way home that night. We were impressed with the hotel. Friendly staff at check-in that was able to give us a good recommendation for a local restaurant close by. The lobby and rooms had very nice décor, and were very clean and comfortable. Would recommend this highly if you find yourself in Coldwater. Thank you for your wonderful review! It's great to hear you found the staff friendly and helpful and the hotel to be nicely decorated and your room clean. We hope that if you are ever in the area again you would stay with us again! Nothing fancy about this hotel, but it was a great place to spend the night. Friendly staff, clean rooms, quiet overnight, the usual hotel continental breakfast, easy to get on and off the interstate. I'll return when I'm in the area again. Thanks for your great review! It's nice to hear that you found the staff to friendly and your room clean. Thank you for choosing to stay with us. We hope to see you soon! We booked this hotel at the last minute while on the road. When we arrived we were greeted by Ashley at the front desk. She was very helpful. The room was clean and comfortable, BUT the room was recently smoked in and being a non-smoking hotel. Obliviously the bottom floor back by the door is used by smokers. This is a pet friendly hotel which was great. The pool area we did not use. The breakfast area was good with an assortment of hot breakfast items. The hotel was renovated I believe in 2012. Thank you for your review. I do apologize that your room smelled of smoke. We try our best to stop people from smoking in our rooms and do charge a fine when we can. I am happy to hear that you found your room to be clean and comfortable and that there was a good assortment of hot food at breakfast. We hope you come back and stay with us again! 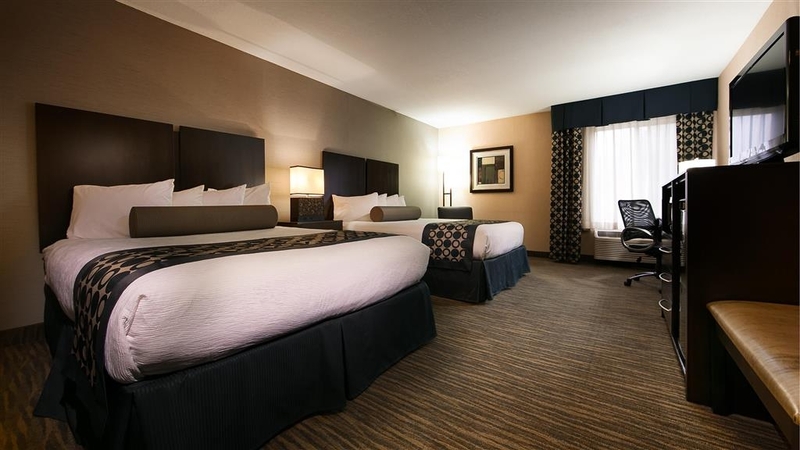 This is the best option for a hotel in Coldwater for the price. I stay quite often, and have had some minor issues with getting into my room. My last stay I became a little irate and did yell at the front desk clerk, Carla. Afterwards, I felt horrible because I know the issues I was having wasn't her fault. Carla stayed calm and professional the entire time. Carla, I am truly sorry!!! Thank you for you kind review. I know it can be frustrating when things go wrong. I apologize for any inconvenience we may have caused you. I'm sure Carla understands. It is nice to know that you choose to stay with us while in Coldwater. We hope to see you again soon! Rooms are spacious & comfortable. Spacious bathrooms. We did not use the pool & hot tub this trip but usually enjoy them. Breakfast was tasty & they even have chocolate milk which earns them bonus points from me. Hotel was very quiet for a Saturday night allowing for a good night's sleep. Thanks!! Thank you for you fantastic review! We are certainly happy that you enjoyed your stay and the that you found your room to be clean and comfortable. It's nice to know that you enjoyed the breakfast. Chocolate milk is definitely delicious! Maybe next time you stay you will be able to enjoy the pool and hot tub. We hope to see you again soon! The staff was helpful and friendly. The room was clean, comfortable beds, nice clean bathroom. Our dog had an accident at checkout and staff could not have been nicer. They ask me to take the dog outside to let him finish and they used a rug shampooer to clean it up. Thank you for your great review! We are so glad that you chose to stay with us. It's nice to hear that you found the hotel to be clean and comfortable and the staff friendly. No problem with the little accident as we all know they do happen! We hope you come back and stay with us again! "A Fine Hotel In Coldwater"
The Best Western Plus in Coldwater, Michigan is a fine place to stay. The check in staff people are pleasant and caring. The rooms are clean and newly furnished. The east side of the building faces a quiet meadow. Thank you for writing such a nice review! I so glad you found the hotel to clean and the staff friendly. We hope you come back and stay with us again! "Best Western plus. Coldwater, Mi." I have stayed many times at this property and am always pleased. They have a motto " people who care" and I have always found this to be the case! The beds are very comfortable and the rooms are quiet . 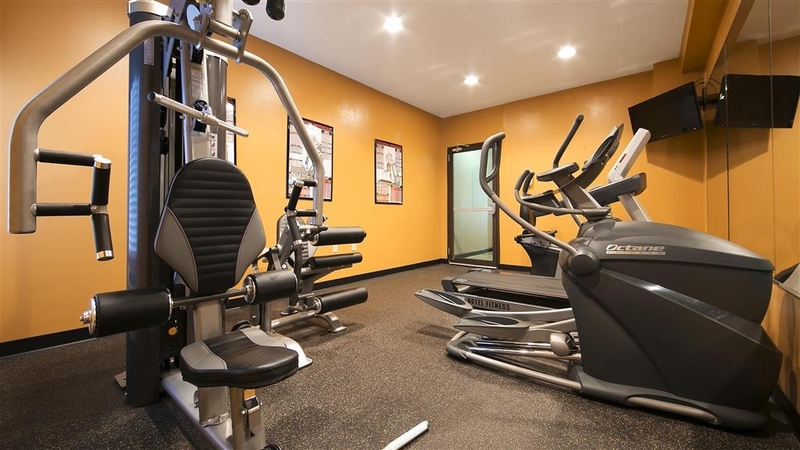 The fitness room has outstanding equipment including the , best treadmill I have ever used, The complimentary breakfast and the breakfast area are great and I always enjoy my morning meal there. What is even better than the food is the service attitude of Cheryl the breakfast host. Coming here was my introduction to the Best Western Chain and encouraged me to book at their other properties when traveling. Thank you for you wonderful review! We are "people who care" and want to make sure all our guests feel at home. It's nice to hear that you enjoy your stay here when ever you come to Coldwater and find the hotel to been clean and comfortable. I am glad that you enjoy the breakfast and fitness center and that Cheryl's service is top notch! We hope to see you again soon!